Max is a seagull. Bob runs a fish 'n' chip shop. Max loves fish … and chips. Yes, it's a match made in heaven! Every day Max helps Bob in his shop, keeping him company, greeting customers and 'tidying up' the odd chip. In the evenings, Bob and Max go fishing together at the end of the pier. But one summer things start to change. Bob seems sad. The shop seems quieter. Change is coming. Then, one day, Bob and his shop are gone. Max waits … and waits … and waits for Bob to come back. But Bob doesn't. So Max goes looking for him. He flies high in the sky, far and wide, until he smells something familiar. What could it be? Marc Martin's book A Forest won the CBCA Crichton Award in 2013. 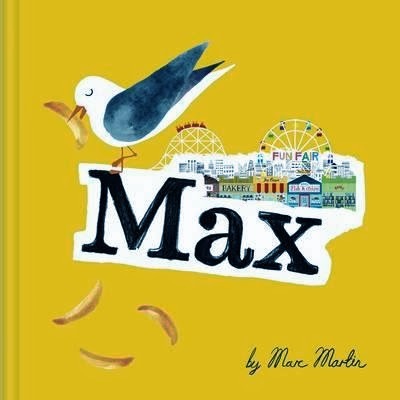 Max reprises that award-winning combination of simple, understated text and exquisite illustration. The images add layer upon layer of meaning to the story. For younger readers, this is a tale of friendship. For parents and older readers, there is additional food for thought as the retro-inspired pictures explore what can sometimes happen under the guise of 'progress'. Marc Martin is an enormous talent. I can't wait to see what he creates next.